Gently wash the basil leaves and remove any hard stalks. Place all the ingredients into a blender and blend until the basil leaves have roughly broken up. Be sure not to over blend the mixture or the basil will break up too much and your mixture will become green. Pour the mixture into two flat trays and place them into the freezer onto flat surfaces. After an hour or so, check the trays and as the mixture begins to freeze, use a fork to carefully scrape any of the mixture that has started icing up. Continue doing this every 20-30 minutes until all the mixture is completely flaked. If you are not serving straight away, just place it into an air tight container in your freezer until you want to use it. 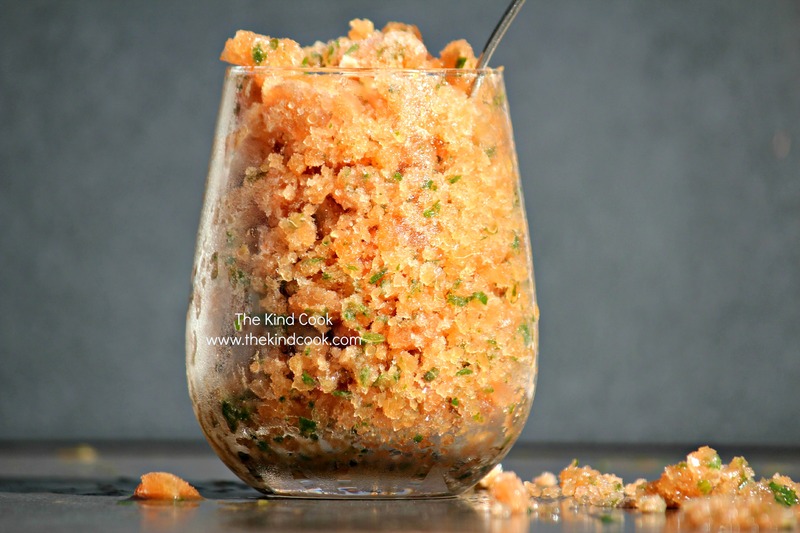 When you are ready to serve the granita, serve it in chilled glasses and eat it before it melts. Time: 10 minutes for preparation. Then simply allow for the freezing process. Notes: I used fresh pineapple and papaya and juiced them in my juicer until I had the desired amount of juice, for each fruit. If your pineapple is super sweet you can get away with using no maple syrup.